Friday 24 May 2013, 19:30-21:00, Eslite Bookstore, 9/F Forum, Hysan Place, Causeway Bay, Hong Kong. A Presentation by the authors: Adam Frampton, Jonathan D Solomon and Clara Wong. Monday 27 May 2013, 12:30-14:00, Luncheon and Lecture at the Foreign Correspondents Club, 2 Lower Albert Road, Central, Hong Kong. A Presentation by Jonathan D Solomon. Tuesday 28 May 2013, 19:30-21:00, Lecture at the Royal Geographic Society, 1/F, The Hong Kong Club, Jackson Road, Central, Hong Kong. A Presentation by Jonathan D Solomon. The 1st Edition of Cities Without Ground has sold out and many booksellers have had limited or no availability in April and May. This week booksellers in Hong Kong have begun to receive the 2nd Edition and it should be in stock in other locations shortly. Interview with Adam Frampton at 0:24:50. Listen Online or Download. 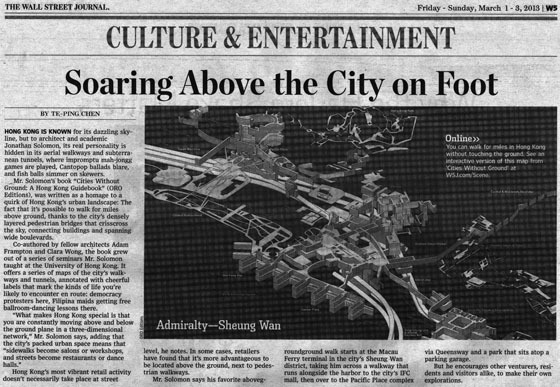 Cities Without Ground has been reviewed in the Guardian and Wall Street Journal, online and print editions. Links to all reviews are located here. On Thursday, 21 February 10:30 AM EST, Jonathan will participate on Panel 1: Transportation and Mobility in Portland, Copenhagen and Hong Kong at the The Innovative Metropolis: Fostering Economic Competitiveness through Sustainable Urban Design. 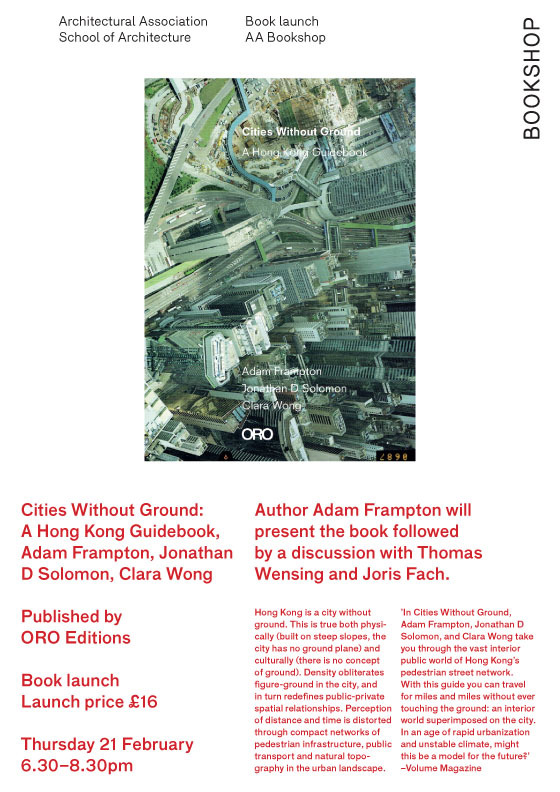 On Thursday, 21 February 18:30 GMT, Adam will present Cities Without Ground, joined by special guests Thomas Wensing and Joris Fach. On 13 February, Jonathan Solomon and Adam Frampton presented Cities Without Ground, joined by special guest Grahame Shane.